Ever want to be a Superhero? All you need is a pair of dice, this book, and imagination! Streamlined rules make it quick to make a Hero, and easy to play. An ENnie nominee for Best Rules, BASH! Ultimate Edition combines rules-lite mechanics with customization. Character generation is so simple, you could fit all the info you need on a 3x5 card, but we included a sheet anyway. Do not assume that by simple, we mean incomplete. 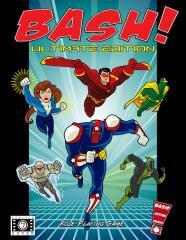 Bash has over 50 versatile super powers, a complete selection of skills, and even rules for collateral damage. The action is fast and furious, paced over a series of panels, pages, and issues, just like a comic book. Make the Hero you want to play! Customize each power to make any sort of superhero from low-powered Mystery Men to Cosmic Heroes who defend the galaxy. BASH allows every hero to shine on a team with mixed character scales. Play in a variety of eras and settings, such as the Golden Age or Silver Age of Comics, Sci-Fi superheroes, and more. Pick up and Play! There are dozens of iconic Hero & Villain archetypes such as the Brick, Martial Artist, and Blaster. These templates can be easily tweaked to quickly have a custom character, so you can jump right in and play. Run a game off the cuff! Lots of information is right at the Narrator’s fingertips. Hordes of Minions! Fleets of Vehicles! Random Plots & Encounters! Become your superhero – with BASH! Ultimate Edition.